﻿ D2SUN universal 6 wires modchip for ALL Nintendo WII! The new SUNKEY LITE 2 (2012 version), support BCA, auto region and region protect! the old sunkey lite need use K1 & K2 to set the correct region,but the new sunkey lite 2 don't need set any switch,can auto detect the region like sunkey. How to install? just same with sunkey lite, plug and play. The last SUNKEY LITE v1.3A (2010 version), support BCA! You can use the on board short point to configure the SUNKEY too, not need install the external configure board if you don't like it . How to install the SUNKEY series? 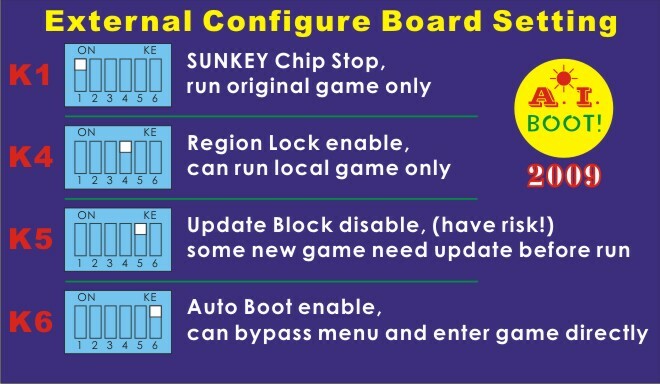 Step #6: Stick the SUNKEY external configure board to Wii case, now enjoy it!